I have recently purchased an ASUS Vivobook S14 with a fongerprint. However, there is no app allwoing me to update it. The laptop has Endless OS. How am I supposed to set up my fingerprint? @InesCC What version of Endless OS are you using? @LeandroStanger do you have any idea how to set the fingerprint on an EndlessOS 3.5.4 ? 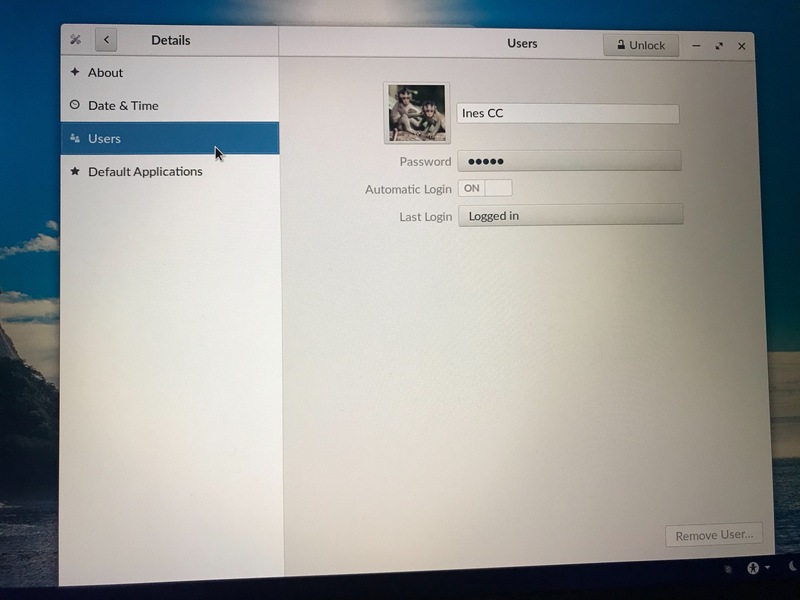 Controls to setup the finger print software is found in the “Users” portion of the Systems Settings. Typing in “Users” in the home screen should bring up the item you need as the top result or near the top. Otherwise selecting your user icon in the lower right portion of the screen will enable you to open the “Settings”. “Users” is part of “Details” which is near the bottom of the list of items on the right of the main Settings window. Select “Users”, The fingerprint setting should show up in the area of your personal setting where you would set or change your password. Thank you, but there is no such option here. I have a Thinkpad with a finger printer reader and that is where the finger printer reader is setup. Since it does not show up for you I suspect that your system does not recognize the finger print reader of there is no driver for your particular finger print reader. On Thinkpads the finger print reader is connected via an internal USB connection. It will show up if you type “lsusb” into the terminal. Typing in “lspci” will show devices that are connected via the pci bus. If your device is recognized and shows up you can do an internet search with the ID displayed in the terminal to see if the device is supported under Linux. The fingerprint setting should show up in the area of your User setting where you would set or change your password. Even if I hit Unblock, the fingerprint button doesn’t show up. Also, the device is supported under Linux. @feaneron @wjt @ramcq Could help?